Set up is rather simple…Choose the size of your dog, the subscription plan you want, and then your dog’s BarkBox is shipped on the 15th of each month. 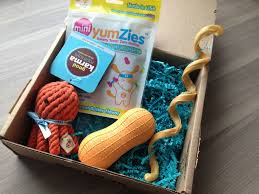 Each box is loaded with “fun toys, healthy treats, and innovative gadgets that will drive pups bonkers,” according to the site. The site also displays some of themes of past boxes. Yes, themes. One was called the “Barklyn Hipster,” and contained chew toys that looked like a slice of pizza and a can of beer, as well as other treats and perhaps some sort of scarf. The “Wintery Mix” BarkBox had penguin and reindeer chew toys, and more winter-themed treats, like snowflake cookies. The “Harvest” BarkBox contained an ear of corn chew toy, a yellow kong, and assorted treats. Clearly some thought and care is put into this. I believe that these folks do indeed love dogs and wish to provide a nice, monthly gift for our favorite pets. The site says that each box contains about $35 worth of items, and subscriptions are as low as $20 per month. Spot fits the “Big & Bold” category as he is over 50 lbs., so I selected that. The other choices are “Small & Cute” (up to 20 lbs.) and “Just Right” (20-50 lbs.). Next are the subscription choices: 12 months at $20 per, 6 months at $24 per, and 1 month at $29. And if your dog is extra playful, $9 more per month gets you another toy. Spot is a chewer, so I took BarkBox up on this offer. In honor of the Olympics, the theme for July was “World Chompians.” Spot’s box contained a plush gymnast chew toy, a nylon medal chew toy, Salmon Snacks, Gold Medal Dog Snack cookies, and a Crunchy Deer Chew. Spot loved the toys, playing with them regularly. The gymnast toy lasted about two weeks before her arms fell off. Good design though, as there is a squeaky ball inside, not stuffing. And the legs slide back and forth, which make them much more difficult for a dog to rip off, even a 50+ pounder. The nylon gold medal is chewed up, but still in circulation. It’s very sturdy and I’m sure Spot will love to play with this toy beyond one month. Spot never met a treat he didn’t like, and this month’s selection added to the list. The Salmon Snacks went quickly (and it’s worth noting that they are grain-free). The American-made Gold Medal snacks were also a hit. They contain lamb, peas, flaxseed and cheddar. Again, no grain, and a good alternative to chicken if that is necessary for your pet. But the big winner in the edible portion of the “World Chompians” BarkBox was the Crunchy Deer Chew. I don’t believe that Spot had ever had deer before, but he loved, loved, loved it. I’ll probably hit the online store and get a few more of those to have on hand. Finally, the BarkBox contained a punch-out gold medal to hang over your pup’s collar. They urge you to take a picture and post it online with appropriate hashtags and such. Great advertising idea.